1.Prepare outdoor grill for direct grilling over medium heat. Sprinkle chicken with salt and 1/4 teaspoon pepper; place chicken on hot grill rack. Cook, covered, 10 minutes or until chicken loses its pink color throughout and internal temperature reaches 165°, turning once. Transfer chicken to cutting board; cover loosely with aluminum foil. Let stand 10 minutes. 2.In blender or food processor with knife blade attached, purée anchovy fillets, garlic, mayonnaise, mustard, lemon juice, Worcestershire and remaining 1 teaspoon pepper until smooth and creamy. Makes about 1-1/2 cups. 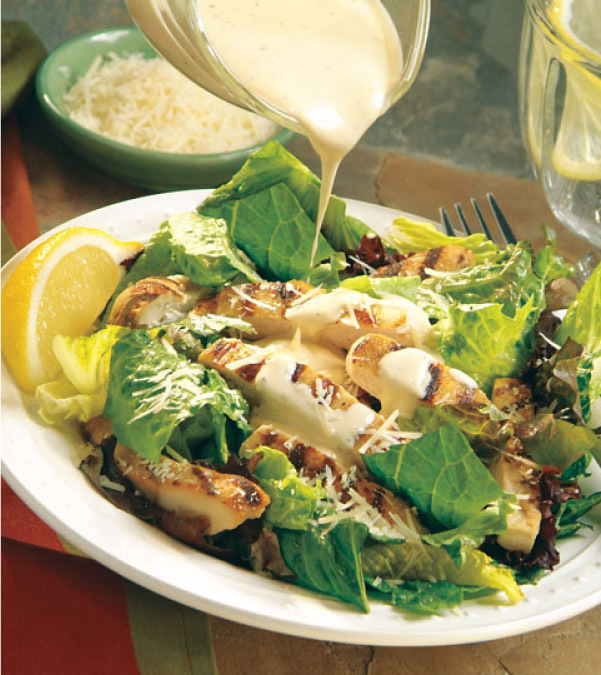 3.To serve, slice chicken; divide lettuce and chicken over 4 salad plates. Evenly sprinkle with cheese and top with 1/2 cup dressing; cover and refrigerate remaining dressing up to 5 days.